When asked during an interview what food I most coveted food in my fridge, my immediate response was cashew butter. Not just any cashew butter, but the pure, raw, organic, single ingredient kind. The writer labeled me a Nut Butter Lover when the article was published Inside the Fridge Welcomes Nut Butter Lover Ronna Corlin. I accept that title. I adore nut, seed and coconut butters. They are a mainstay in my whole food, plant-based diet. In fact, you can find me on any given day, at any given meal, delving into a jar of one of a dozen plus varieties I keep on hand, in preparation of nutrient dense meals that provide plenty of satiety. Open my cupboard and a dollhouse-like assortment of favorite spreads appear. Some hold residence inside my fridge. It depends upon the texture I seek. I'm a collector for sure, but it goes beyond that for me. While I relish eating and cooking with these butters, I take equal pleasure in tweeting, pinning and posting about them. Yesterday, one of my favorite artisan purveyors JEM Raw Organics, maker of premium sprouted nut spreads announced the birth of a new member of their nutty family - Cashew Cardamom. #areyoukiddingme. I do fancy their Superberry Maqui Camu. If you can imagine peanut butter and jelly all grown up, this would be it. Boom! What draws me to these plant-built butters is that they have all of the qualities I seek in food these days. They're real, nutrient dense food - easily incorporated into a plant-powered lifestyle. But nuts have gotten a bad wrap. New York Times Personal Health columnist Jane Brody recently stated that she has been avoiding '"some of natures most perfect and healthful foods: nuts and peanuts" for more than half her life. Recent studies she shared, have lead her to revisit nuts. Functional medicine man Dr. Mark Hyman suggests nuts & nut spreads provide healthy fat - a necessity at mealtime. It is the excess added sugar in our diet, rather than healthy fat that triggers overeating and keeps the pounds on. The great thing about nut butters is that they provide incredible satiety. What a great feeling you have when you eat deliciously and are no longer hungry nor overly stuffed. It's those processed nut butters with added refined sugar, processed oil and extra salt that hijack the appetite and lead to overeating and weight gain. 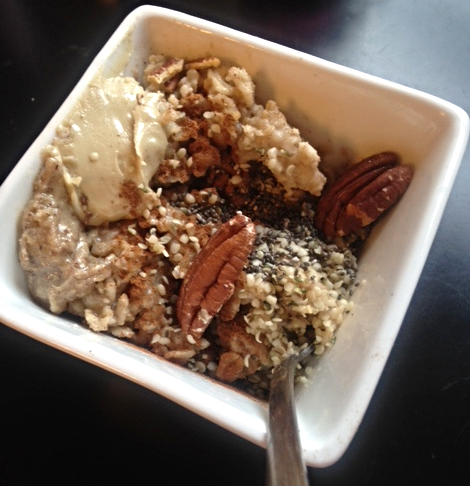 I'll add different nut butters to my oatmeal bowl in the AM, always on the side to preserve the flavor's impact. I might spread a local lettuce leaf (Butter lettuce or Green Leaf) with raw cashew butter and garnish with raw cocoa nibs, hemp seed or chia. More greens in my morning routine is anything but routine. It is more like an energized culinary adventure. There will never be too many raw, organic, non-GMO, vegan, enzyme-rich, cocoa and spice-infused nut butter options on market shelves for me. They're my jam.